At CrossFit 515, we make starting CrossFit simple, fun, and non-intimidating. The best way to get started at 515 is sign up for our “Intro to CrossFit 515 Class” that is offered on Tuesday evenings. This is time we set outside of a normal class to help introduce the CrossFit methodology and some of the movements we will be performing. After we have gone over some of the basics to help you feel more comfortable we go through a typical CrossFit workout. 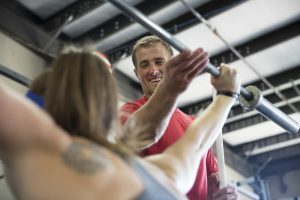 This course is definitely the best way to get started at 515 whether you are completely new to CrossFit or if you are experienced with CrossFit but looking for a refresher. Contact us if you are unable to make the times for the Intro session and we can discuss what would be best. We still offer the week free for you to give us even more of a test drive, starting with the Intro Class. If you become a 515 member after your trial we will prorate the remainder of the month. During your first week at CrossFit 515 you can expect to be exposed to a wide variety of different movements and workouts. You will probably do some things you have not done before. You can expect to work hard, but also have lots of fun. You will receive one-on-one attention with our excellent team of trainers, meet new people, and become a part of a great community of people. Also see our FAQs page.